Global Herbs Hocks is specially formulated to maintain optimal strength and lubrication in the small bones which make up the hock. It is used to simplify the management of horses with limb mobility issues. Hock problems are common and hard to counter, but with StrongBone's ingredients of calcium, magnesium and phosphorus, you can enable the horse's body to produce superior joint fluid with higher levels of HS and better lubricating ability. Edible stemmed vine, Arjuna fruit, Garlic, Ginger. For a 500kg horse feed 2 blue 25ml scoops twice daily. A 1kg tub of Hocks will last an average horse 3-4 weeks. This rate of feeding should normally continue for a minimum of 3-4 months. After this time the rate can be reduced to approximately half the recommended amount. 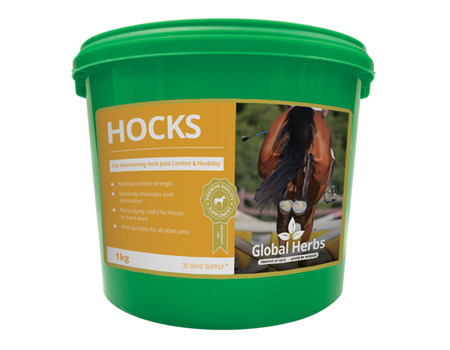 There are currently no questions for Global Herbs Hocks for Horses - be the first to ask one!